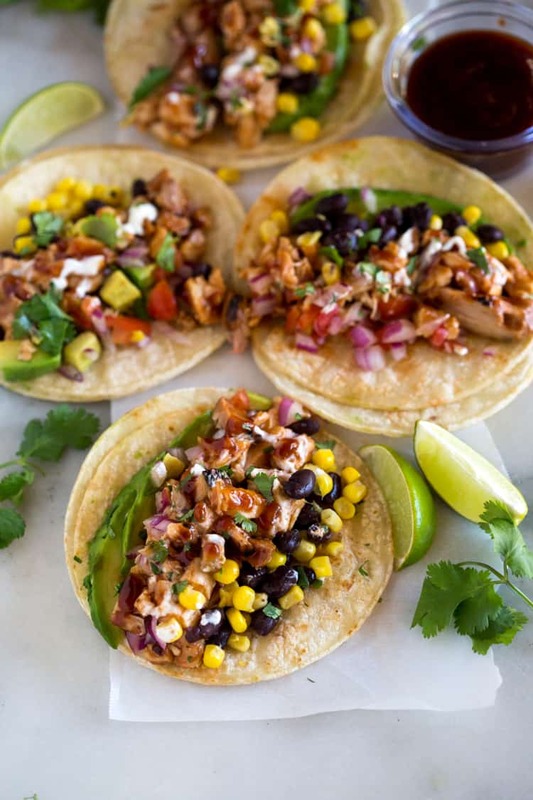 Grilled BBQ Chicken Tacos topped with black beans, corn, tomatoes and avocado with a creamy cilantro lime sauce. This easy and healthy meal will become a family favorite! Hey everyone, this is Lauren visiting from Tastes Better from Scratch, where I share easy homemade meals made with real ingredients. I’m the mother of three young kids, and like so many moms out there I feel like I’m constantly needing quick, family-friendly dinner ideas to feed my crew. I particularly love to feed my family “all-in-one” type of meals, meaning meals that include protein, veggies, carbs, etc all tossed together in a wrap, or rice bowl. It’s easier for me than making a stand alone dish that needs to be accompanied by sides. These Grilled BBQ Chicken Tacos fit the bill. They’re packed with protein, healthy unsaturated fats they take less than 30 minutes to make! Chicken breasts and thighs are two of the easiest types of meat to cook on the grill. I prefer to use chicken thighs when grilling, because dark meat is more forgiving on the grill and doesn’t dry out as easily, thanks to its higher fat content. Many people prefer white meat when grilling chicken, so you can use chicken breasts, instead of thighs. Chicken breasts on the grill take about 4-5 minutes to cook on each side. Flip them only once, and cook them over medium heat. Chicken thighs may take a few minutes longer than breasts. Use a thermometer if you’d like, and cook the meat to 165 degrees F. Be sure to allow it to rest for a few minutes before chopping it up to serve with tacos. These bbq chicken tacos are marinated in bbq sauce for up to a few hours before being cooked on the grill. 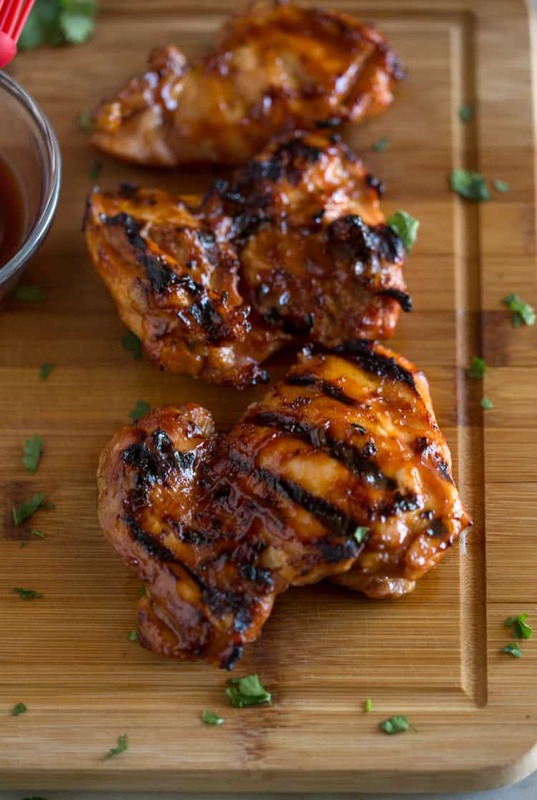 Make sure to spray your grill with some non-stick cooking spray so that your chicken doesn’t stick to the grates. 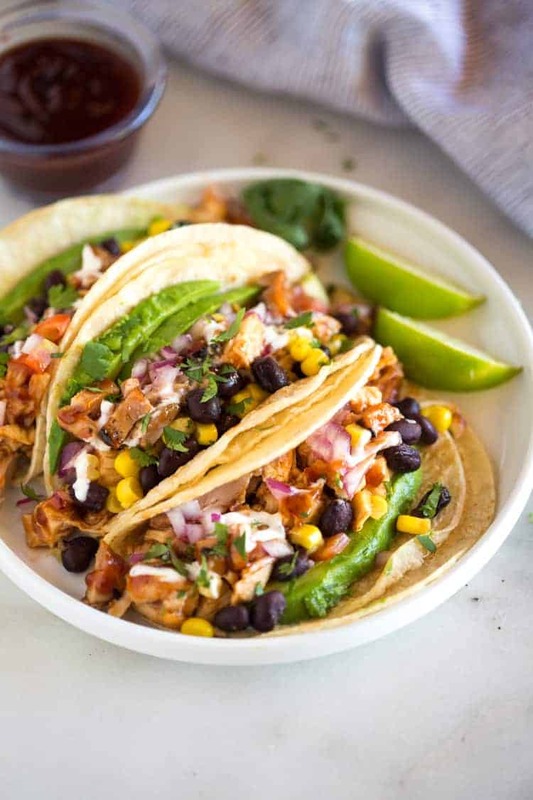 To prepare your tacos, add a spoonful of cooked, chopped chicken, corn, black beans, tomatoes and avocado to a warm tortilla. Drizzle extra bbq sauce and cilantro lime sauce on top and enjoy! You can heat corn tortillas in a skillet on the stove, or on the grill when you cook the chicken. Cook them for just a few seconds on each side, until small brown spots appear. Transfer them to a plate and cover, or wrap them with tinfoil to keep warm. Stack them as you go, making sure to re-cover them after each addition. The microwave is my least favorite way to warm corn tortillas because they stay soft and flimsy, allowing them to fall apart easier when you add all of your taco toppings. If you don’t have black beans, pinto beans would make a great substitute. Feel free to add additional vegetables, like grilled zucchini, chopped lettuce, or olives. Substitute tofu to make the tacos meatless. Grilled tofu takes about 3-4 minutes on each side, side cook. I prefer to serve these chicken tacos with corn tortillas, but the small taco-size flour tortillas would work great as well! Grilled BBQ Chicken Tacos topped with black beans, corn, tomatoes and avocado with a creamy cilantro lime sauce. Add chicken and ⅓ cup bbq sauce to a ziplock bag. Refrigerate up to 3 hours. Warm tortillas on grill or in a hot skillet. Add a spoonful of chopped chicken, corn, black beans, tomatoes and avocado to each warm tortilla. Drizzle with extra bbq sauce, and cilantro lime sauce. Garnish with fresh cilantro. Enjoy!